A-HOTEL.com - Cabo da Roca house. 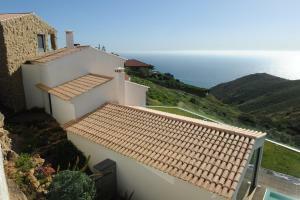 Rent a private villa in Cabo da Roca. Cabo da Roca Villas. Rent a private house,chateau in Cabo da Roca. Enjoy full privacy and space in your home. 43 Rua da Lagoa de Baixo is set in Adraga. Guests may enjoy free WiFi. Set 12 km from Pena National Palace and 12 km from Sintra National Palace in Sintra, One-Bedroom Holiday Home in Colares, Sintra offers accommodation with a kitchenette. This property is 13 km from Quinta da Regaleira. Three-Bedroom Holiday Home in Colares, Sintra enjoys a location in Sintra, just 9 km from Sintra National Palace and 12 km from Pena National Palace. Guests staying at this holiday home have access to a fully equipped kitchenette. Located in Sintra, 12 km from Pena National Palace, One-Bedroom Holiday Home in Colares, Sintra offers a living room with a TV. The property is 12 km from Sintra National Palace and 13 km from Quinta da Regaleira. Situated 12 km from Pena National Palace in Sintra, Studio Holiday Home in Colares, Sintra offers accommodation with a kitchenette. The accommodation is 12 km from Sintra National Palace. Located 12 km from Pena National Palace in Sintra, Two-Bedroom Holiday Home in Colares, Sintra offers accommodation with a kitchenette. The accommodation is 12 km from Sintra National Palace. Two-Bedroom Holiday Home in Colares, Sintra enjoys a location in Sintra, just 12 km from Pena National Palace and 12 km from Sintra National Palace. The accommodation is 13 km from the Quinta da Regaleira. Villa Casa Turquesa is situated in Sintra, 11 km from Sintra National Palace, 12 km from Quinta da Regaleira, as well as 15 km from Moors Castle. Featuring private parking, the villa is 16 km from Pena National Palace. Holiday Home Quinta da Vigia T1 in Sintra offers accommodation with free WiFi, 13 km from Sintra National Palace. This property offers access to a terrace. Located in the village of Colares, 7 km from Sintra, Quinta da Varzea is a 3-bedroom house surrounded by a garden. It features free private parking and WiFi in all areas.